I was excited to retweet/extoll the progressive-mindedness of one of my favorite picture book creators, when I came across a journal article that sociologist John Levi Martin wrote in Poetics from 2000 about Scarry’s What Do People Do All Day? (1968). Martin argues that despite bucking gender stereotypes, Scarry reinforced stereotypes about class and what types of animals—the stand-ins, or “totems” of people—tend to perform specific types of jobs. As a result, I became interested in what sorts of unintended or implicit biases we as writers and illustrators for children may bring to the bigger table when we’re toiling away at our drafting tables, and what implications this has for kidlit people now. Martin notes that pigs were disproportionately employed in certain low-education/low-income jobs, those “involving stone, sanitation, and then the somewhat irresponsible (as it turns out in the text) fire-fighters and house-painters.” Cats and rabbits possess by far the more “feminized” jobs (seamstress, nurse, flight attendant). Martin’s data analysis reveals some interesting patterns when it comes to what animals are in charge of in Busytown and have high-education/high-income positions: “ foxes in particular, and predators in general, are most likely to be in positions of command.” The mayor is a fox, the doctor is a lion, etc. Martin cites anthropologist James Fernandez: “Children come to quickly perceive a difference between a cow and a cat, chicken, dog, donkey, etc. … In their earliest search for identity, these children turn towards the imitation … of some animals rather than others, choosing animals that occupy the more desirable portions in the quality space of their culture." What does it mean when someone is referred to as a pig or lion? Children are highly aware of the differences and meanings of these animal totems and categories, and, according to Fernandez, they tend to learn them at the same time as they enter verbal thought. “In supplying this content, through literature and informal interpretations of animal behavior, adults shape the possible applications of the categorical structure of animals to the social world.” Many children could receive this way of categorizing through picture books like What Do People Do All Day? before they have a chance to experience or understand class on a first-hand basis. Martin also notes that the title of the book is not What Do Animals Do All Day?, which reinforces that while seeing mice, dogs, cats, etc. on the page, you’re learning about people. By extension, how is the act of labeling and associating different animals/people to certain jobs reflected in the workplace and larger world? Richard Scarry’s picture books—and picture books in general—are cultural artifacts that reflect a time and attitude, just like today’s stories will be remembered as cultural artifacts that will reflect, for instance, the Internet and technology, global changes, social movements like We Need Diverse Books. Richard Scarry was sensitive to the impact of his work on children, and his “updating” his books thirty years later (after receiving much public protest) certainly reflects his sensitivity and awareness of his reach to children globally (according to Amazon, he illustrated over 150 books that sold over 100 million copies and are translated into over 20 languages). 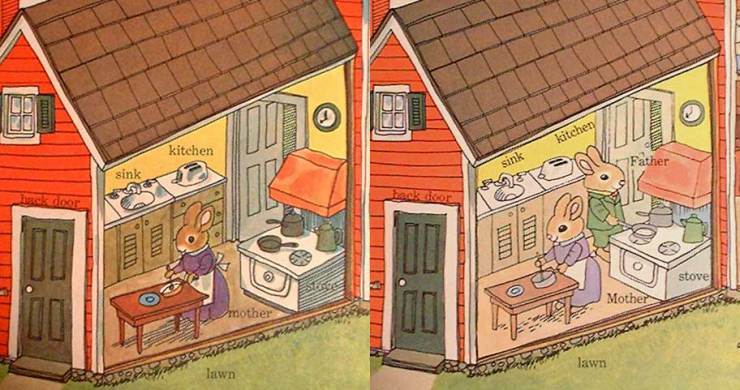 I don’t think that it’s wrong that Richard Scarry’s Busytown oeuvre expresses that society has class divisions. The problem occurs with implications when the author’s biases and values seep in. For example, what are the implications when the lower classes are depicted as the ones who are the source of most of the problems in a town? Or what is implied, for example, when slaves are shown smiling throughout a picture book? Where does this leave kidlit writers and illustrators? I agree that a book that’s written by rule-following and perpetual hand wringing could create some of the least-creative, least joyful work out there for children. As someone who works with animals-as-people (though not as encyclopedic as Richard Scarry), I realize this is perhaps something to be conscious of when selecting animals to fill certain character types, as this could impact a child’s structural understanding of how people fit into the world. Animal characters should be assigned with care and thought, if not a creative, joyful touch. Is it the kidlit creator’s job to write books that reflect society or suggest its reform? I think there is room for both. But it’s important to acknowledge that books we put out have an impact. They can either open up new ways of thinking or confirm potentially problematic biases.